I was testing this brioche recipe a couple days ago to see if it was a 'keeper' cause the ones I tried before were good but quite average-quality after all. They would come out good but would get too dry the day after baking them and also I was looking for a healthier, lighter version with no butter. Not too sweet, very tender and super spongy...right what I wanted, and the dough has zero butter so that means I will be making these cuties again in less than two weeks to celebrate Midsummer's Eve (what we call in Spain 'Noche de San Juan' which translates to St. John's Eve) on the 24th of June. One year ago I published these two recipes of other typical cakes (called 'Coques' here in Catalonia) that we also eat that day/night, there are also many other versions of the recipe I'm sharing today: you can decorate them with Confectioner's Custard (Crème Pâtissière or French pastry cream) on top, add candied fruits or fill them with chocolate mousse, marzipan and even whipped cream. 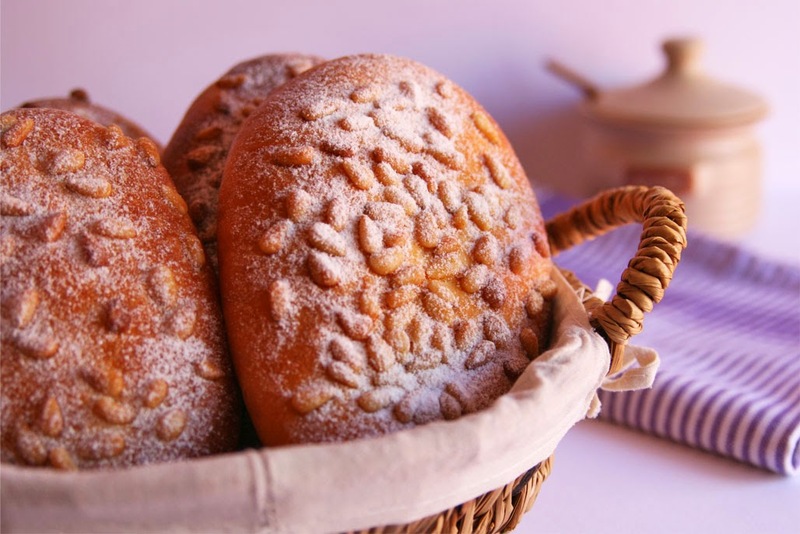 My favorite one is the brioche cake with vanilla custard and pine nuts on top; I personally like to enjoy it with a glass of super cold champagne. So festive and so yummy! 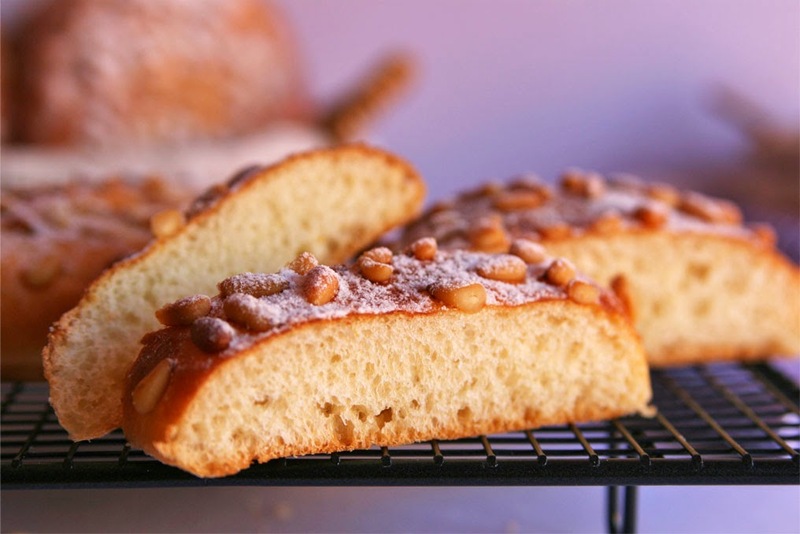 I will try to bring you more brioche-style cake recipes as soon as I bake them next week...if I can hide them away in a secret corner of my kitchen, where no one at home can reach them. Because once you grab a piece of these tender cakes you can't stop! 2 cups (265g) bread flour. 1/4 cup (32,5g) potato starch (or cornstarch). 3 tbsp plus 2 tsp (55ml) extra virgin olive oil. 1/4 cup plus 1 tbsp (75ml) water. 1 tbsp approximately (0.5 oz/15g) fresh yeast. zest of half lemon (or a little less). zest of half orange (or a little less). I highly suggest you to use your stand mixer fitted with the hook attachment to work the dough. I like to end the mixing/kneading process by hand to ensure it has the right consistency and elasticity and to avoid over-mixing. Place all ingredients, except olive oil and fresh yeast, in the bowl of your stand mixer (remember to use the hook attachment). Mix all ingredients and work the dough until you get a quite hard dough ball, gradually add in olive oil without stopping the mixer until it has absorbed all the oil. Dissolve in a few drops of water the fresh yeast and add it to the dough. Work the dough for 3 more minutes approximately until the yeast is fully incorporated. If the dough gets too hard/dry you can add a bit more water but I didn't find it necessary. 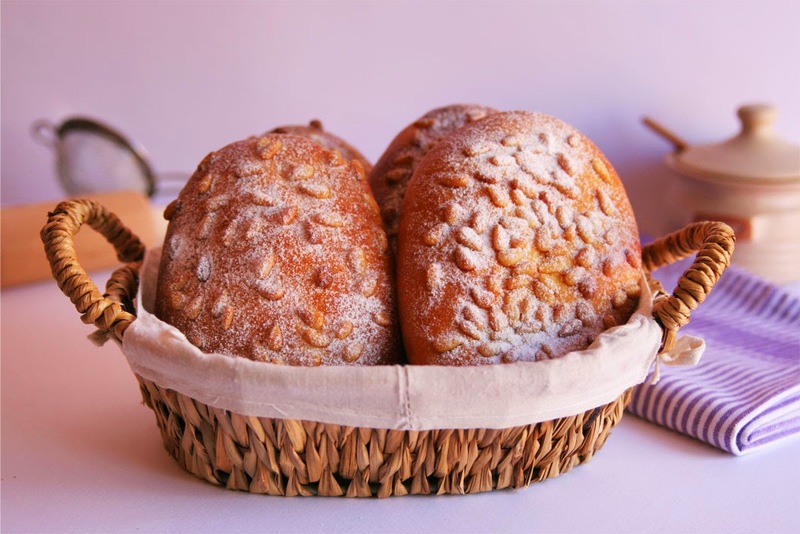 Place the dough ball in a large bowl greased with olive oil and covered with a damp cloth. Let it rest for 90 minutes. It is very important to have patience and respect the resting times. Divide the dough in 7 portions (each ball should weigh around 2.8 oz/80grams), form small balls and let them rest 30 minutes in a warm place free from air drafts. 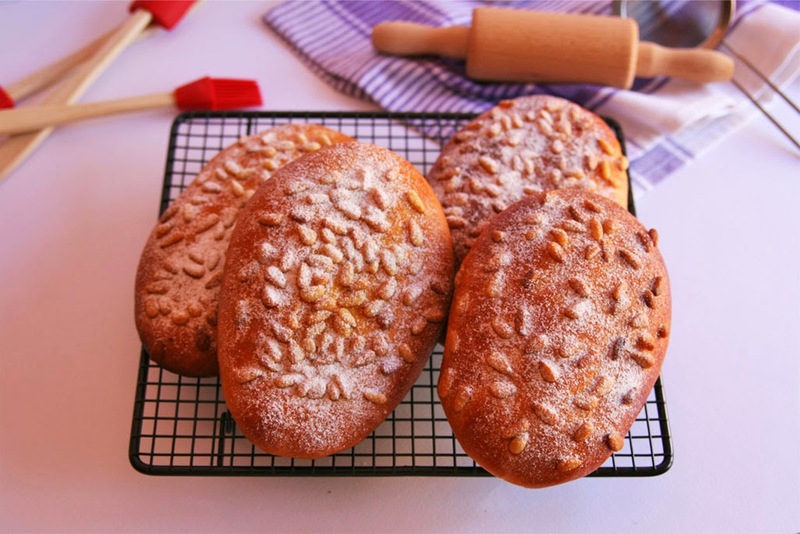 Dust the working surface with some flour and roll out the dough balls to form flat and oval-shaped pieces. Place the cakes in a parchment-lined baking sheet leavin enough space between them so they'll rise. Brush the tops with the beaten egg (salted). 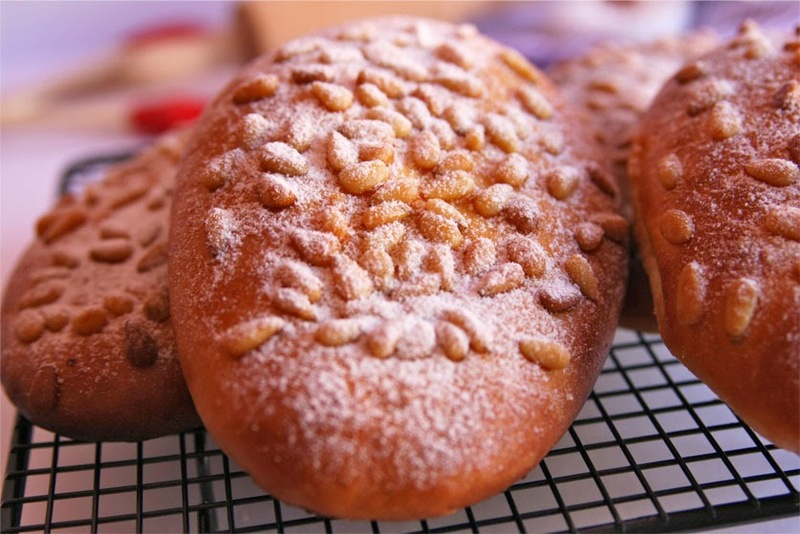 Sprinkle a generous amount of pine nuts over top and press lightly to adhere. Let the cakes rise (leaven) for 90 minutes approximately. Preheat oven to 428 ºF (220º C). Once the cakes have risen and look fluffy dust with confectioner's sugar (powdered sugar) and bake them for 12 minutes until the bases get brown (not too dark) and golden/dark golden on top. This recipe is linked to the #CookBlogShare party of SuperGolden Bakes. Cheers for this excellent recipe that will be very easy to turn into a vegan recipe. Not hard to replace 1 egg at all. Thank you so much! Yes, actually it's a recipe very easy to 'veganize'. :-) Let me know if you try it, please! Me too Lucy. I like to try traditional recipes from other countries to taste different flavor combinations, etc. 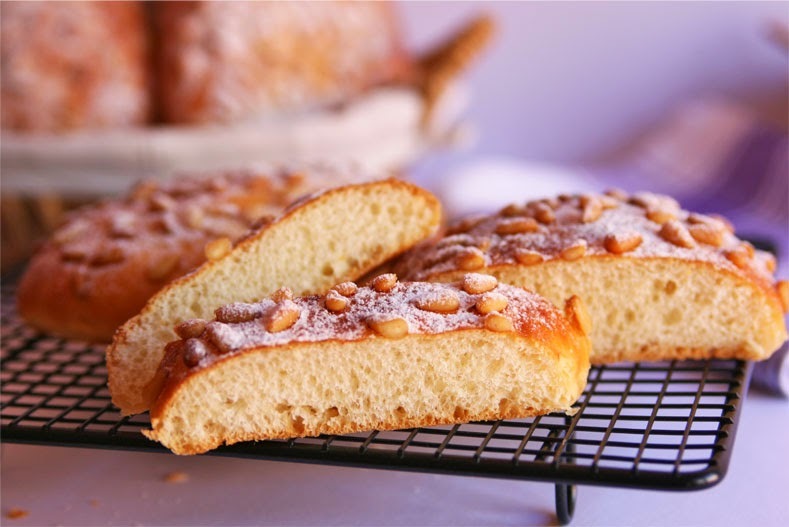 When I make these cakes I always buy good quality pine nuts so they are very tender on the inside but a bit crunchy outside and make a nice combination with the tenderness of the brioche. 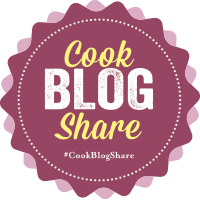 Thanks to you for the awesome idea of the #CookBlogShare link party!